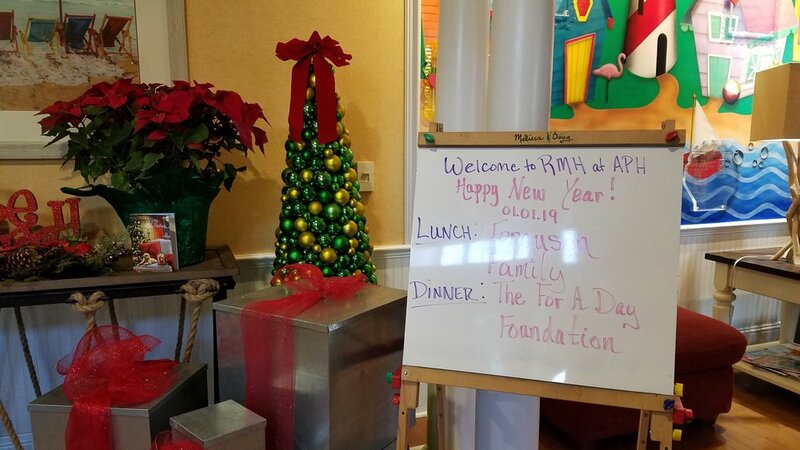 The Orlando Chapter of the For a Day Foundation decided to start 2019 off with a New Year’s Day visit to one of the Ronald McDonald Houses of Central Florida (Arnold Palmer). Freshfields Farm was kind enough to provide all of the fresh produce and meats that we needed to provide the residents with a wonderful dinner. On the menu was baked ziti, mac and cheese, salad, garlic bread and chocolate chip cookies! After preparing dinner, we put together bags with tiaras and wands, superhero capes and masks, coloring books, glow-in-the-dark sticks and snacks. Once the families had arrived for dinner, we went around the dining area handing the bags out to the children (9 boys and 8 girls). We also met a father whose daughter was born right before Christmas and was not able to leave the hospital yet. He was kind and spoke positively, talking to us for a while about how hard, yet wonderful being a new father has been. We wanted to send him back to his family with something for the future, so we found the smallest tiara we had and gave it to him for his little miracle. This visit was a great way to start the New Year. We look forward to many more visits to our local Ronald McDonald Houses. Thank you to Emma, Olivia, Tonya, Emma, Alison and Maureen for coming ready to cook and clean! And a huge thank you to Freshfields Farm for the generous donation!